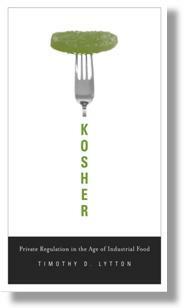 Albany Law School professor Timothy Lytton has a new book, Kosher: Private Regulation in the Age of Industrial Food. A key point is that this topic is more broadly relevant than one might think, because kosher food is just one of many examples of food regulation systems that can be adopted by the private sector. Lytton was interviewed on the What is Your Food Worth? blog. As a general matter, private food safety audits and industry-sponsored nutrition labeling schemes have been a great disappointment. Behind most major food-poisoning outbreaks is some private auditing firm that gave the food producer a phony five-star rating. And when nutritional rating schemes give high marks to sugary cereals and full-fat ice cream, you have to wonder. As a kosher-observant Orthodox Jew, I realized that kosher certification offers a 2000 year old example of private food certification. My initial suspicion was that kosher certification was full of price gouging and unnecessary, super-stringent standards. As I began to get into my research, however, I found that, although fraud and corruption were rampant a century ago in kosher meat production, today’s kosher system is highly reliable. My book tells the story of how, within the span of a century, kosher certification became the one of the most reliable systems of private certification in the food industry, indeed, perhaps in any industry. 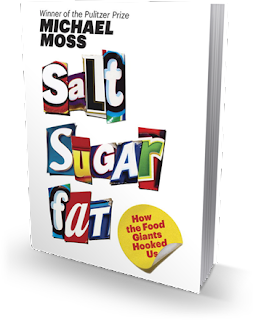 New York Times reporter Michael Moss's book released this year is Salt, Sugar, Fat: How the Food Giants Hooked Us. The book has some older themes and some newer distinctive contributions. The basic indictment of highly palatable processed food is familiar to readers of Michael Pollan, Marion Nestle, Eric Schlosser, and David Kessler, and to viewers of movies such as Supersize Me and Food, Inc. The novelty and strength of Moss's new book is the persuasive on-the-record interviews with food industry executives and scientists as they try to understand the consequences of their products and even to make improvements. I ended up with two competing impressions. First, I felt sympathetic to the industry scientists and executives, several of whom really would have preferred to sell better products, but who were defeated by competitive pressures. Second, it seemed that the industry people themselves are usually naive about the possibility of making substantial improvements on a company-by-company voluntary basis. I say "usually" naive, because I think deep down they know their efforts are partly for show, and at key junctures the industry scientists and executives are forced to be blunt about the real situation. I have seen this pattern in my own conversations with food industry scientists and executives. In nine sentences out of ten, they will express great optimism that their company can make healthy changes in its product mix. Then, in the tenth sentence, especially if pressed with a hard question about whether the proposed changes are sufficiently ambitious to make a real difference, they will say, "Oh, well, don't be unrealistic. You can't expect THAT from us in the real world of competition." An article-length version of the book was published in the New York Times Magazine. 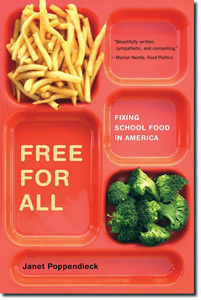 The Grocery Manufacturers Association released a statement treating Moss's book as an "obesity book" with an unfair axe to grind: "Michael Moss’s work misrepresents the strong commitment America’s food and beverage companies have to providing consumers with the products, tools and information they need to achieve and maintain a healthy diet and active lifestyle." But this statement misses a key theme of Moss's book, which focuses above all on the quixotic efforts of industry scientists and executives to make improvements. The food industry visualizations of Michigan State University professor Phil Howard focus on relationships among businesses or sectors within the food system. It is interesting how visualizations can carry different implicit messages even when they seem at first to address the same topic. ... while the second of these visualizations emphasizes the comparatively heavy concentration at the corporate level. 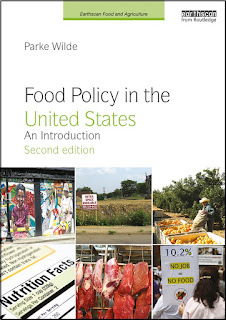 For more about the food system more generally, see Howard's 2012 working paper with Harvey James Jr. and Mary Hendrickson. More to come on this topic of food system visualizations. The Washington Post this weekend published a long and thoughtful feature by Eli Saslow titled: Food Stamps put Rhode Island town on monthly boom-and-bust cycle. At precisely one second after midnight, on March 1, Woonsocket would experience its monthly financial windfall — nearly $2 million from the Supplemental Nutrition Assistance Program (SNAP), formerly known as food stamps. Federal money would be electronically transferred to the broke residents of a nearly bankrupt town, where it would flow first into grocery stores and then on to food companies, employees and banks, beginning the monthly cycle that has helped Woonsocket survive. For research background, my dissertation in the late 1990s and the resulting article with Christine Ranney in the American Journal of Agricultural Economics provided the first nationally representative estimates of the monthly cycle in food spending and food use for food stamp program participants. My 2002 article with Margaret Andrews in the Journal of Consumer Affairs used Electronic Benefit Transfer (EBT) data to get an even sharper view of the exact timing of food stamp and cash transactions over the course of the month. In 2005, Jesse Shapiro provided more economic insight in the Journal of Public Economics. In a 2012 article in the American Journal of Clinical Nutrition, Harvard researchers Cindy Leung, Walter Willett, and Eric Ding recommended further research on whether the monthly SNAP cycle could be related to risk of overweight. One policy-relevant question is whether the federal government should ever consider providing benefits twice monthly. Michigan considered such a policy in 2008, but I think it never came to pass. One objection I have heard is that twice-monthly benefit delivery is paternalistic and might force low-income SNAP to conduct a potentially burdensome shopping trip. This argument seems incorrect to me. Let me lay out the case in an orderly fashion. Whether benefits are delivered once or twice monthly, SNAP participants can freely choose whether to shop once or twice monthly. If benefits are delivered to the EBT card once monthly, then a SNAP participant who wanted to shop once monthly is perfectly satisfied, but a SNAP participant who wanted to shop twice monthly and smooth consumption over the course of the month must save half the benefits for use two weeks later. If benefits are delivered to the EBT card twice monthly, then a SNAP participant who wanted to shop once monthly must save half the benefits for use two weeks later, but a SNAP participant who wanted to shop twice monthly and smooth consumption over the course of the month is perfectly satisfied. The key point is that the two policies are exactly equally paternalistic. When middle-income speakers say that twice monthly benefit delivery is paternalistic, they implicitly assume that it is most natural for low-income people to shop once monthly and go hungry later -- a shopping pattern that the middle-income speakers would never use themselves. I think it is the middle-income speaker's implicit assumption that really is paternalistic. Any policy such as twice-monthly benefit delivery should be pilot tested. The pilot should explicitly ask SNAP participants whether they had any shopping difficulties or budget difficulties, and whether they liked the new policy better than the old one. It is possible that the new policy will reduce the occurrence of episodes of food insecurity at the end of the month. The current policy should not be preferred based on implicit assumptions. SNAP participants deserve an influential voice in this decision. The International Dairy Foods Association (IDFA) and the National Milk Producers Federation (NMPF) have petitioned FDA to modify the standard of identity for milk, permitting companies to add a non-calorie sweetener without additional labeling. The petition proposes to allow dairy companies to add the non-nutritive sweetener aspartame to milk, without being required to label the milk as "low-calorie" or "low-sugar." Currently, aspartame is allowed in milk (just as in diet soda), but such milk must be labeled to let the consumer know. IDFA and NMPF argue that nutrient content claims such as "reduced calorie'' are not attractive to children, and maintain that consumers can more easily identify the overall nutritional value of milk products that are flavored with non-nutritive sweeteners if the labels do not include such claims. My view is that milk with aspartame should be labeled as clearly different from regular milk. The push to market sweetened milk through child nutrition programs is a debatable public health nutrition strategy, whether the milk is sweetened with sugar or aspartame. The drive for sweetened milk seems like dairy industry marketing as much as sound nutrition program design. It may be better to let children cultivate their taste for less-sweetened foods and beverages. Although reasonable people may differ on that point, it would be unwise to settle the matter by allowing sales of aspartame-sweetened milk without noticeable labeling. You can submit comments to FDA (by May 21) and read comments from others here. Some comments already submitted are strongly opposed. Hat tip to Ashley Colpaart. The patents for Monsanto's first generation of pesticide-resistant soybeans will expire in 2014. Genetically modified organisms (GMOs) have for many years been protected by patents, which allow one company to forbid farmers from saving and growing a particular type of crop seeds. Without patent protection, farmers will be able to grow the pesticide-resistant soybeans, called Roundup Ready soybeans, without paying royalties and licensing fees to Monsanto. For example, the case of the farmer Vernon Hugh Bowman was argued before the Supreme Court last month, receiving a lot of attention. Bowman had purchased commodity soybeans, meaning non-brand-name soybeans ready to be used by food manufacturers. A substantial fraction of his commodity soybean seeds did indeed have the Roundup Ready trait, merely because most U.S. soybeans have this GMO trait. After patent protection expires in 2014, a farmer such as Bowman would be free to do as he likes. Monsanto will still use patents to protect the company's new line of GMO soybeans, called Genuity Roundup Ready 2 Yield. There had been some fear that Monsanto would use patents on specific seed varieties to extend the protection of first-generation Roundup Ready technology, but -- if I understand this Monsanto press release correctly -- it appears the company plans to let this first-generation technology really enter the public domain without any trickery involving specific seed varieties. Monsanto does not plan to require farmers to destroy unsold seeds from the final patent-protected harvest, but instead the farmers may go ahead and save those seeds for the first legal non-licensed planting. We should not exaggerate the importance of this news. The change makes little difference for organic farmers or for people who have broad food safety concerns about GMOs. If anything, wider availability of inexpensive Roundup Ready seed could worsen the problem of new weeds that are resistant to glyphosate (the generic name for Roundup). The end of patent protection could in principle lead to new university-based crop breeding programs that seek to make seed technology more freely available, although I wonder if U.S. universities have lost the capacity to do so without corporate financial support. Yet, for some people who follow the ferocious public debate about GMOs, the end of patent protection seems like a big deal. It helps to weaken the perceived linkage between the two distinct concepts, "GMO technology" and "corporate control of the food system." 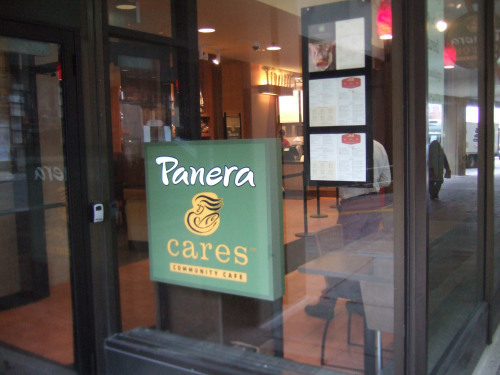 Walk into the 1-month-old Panera Cares community café in Center Plaza across from Boston City Hall and look around. Notice anything different? There are great scents, a line at the counter, laptop-tapping at a nearby table, pleasantries exchanged about the weather – all the usual sights and sounds of a weekday morning caffeine rush. But unlike the Panera cafés you may have visited before, this one doesn’t have prices listed next to the items on the menu board. Instead, there are suggested contributions. And, if you choose, you don’t have to pay anything at all for your meal. The Sprout also includes a review of the New England Journal of Medicine's list of weight loss myths, ways to keep active in Boston, and more.